The one and only book to learn thermodynamics. Last week I was having dinner with friends in a restaurant in northern New Mexico. All physicists, slightly drunk, we were debating as different topics as "why did Hannibal not march on Rome after annihilating its legions at the battle of Canne? ", or "how could those 19th century guys figure out a concept as like entropy BEFORE knowing statistical mechanics", when many lamented how unnatural thermodynamics felt as undergraduates, and how all textbooks were perhaps not incomplete but incapable of convey the physics. And then I said "well, there is Fermi's Thermodynamics..." end soon everybody agreed. My freshman course in thermodynamics, in Italy, was based on this book: although it is short and concise, no other text has its compelling clarity in explaining the basic laws. And it has that distinctive Fermi style: cutting the crap, straight to the physical point. Undergraduates learning the subject on any other book are really missing out. I bought this book about two years ago and read through the first two chapters and completed the practice problems. Since then I have gone back to school for a Masters in Mechanical Engineering and am taking an Advanced Thermodynamics course. I pretty-much don't need anything else but this 150 pg. book. It is very clear, to the point, great derivations, and is making my life extremely easy. Get this, it costs only $10 and worth much more. With this book, Fermi explains the concepts of thermodynamics in such a beautiful and simple way that the only word I found to describe it is: Elegance. The explanation doesn't cover kinetic theory fundamentals but the way exposed on the thermodynamics phenomena is made in such a clear and simple way that can be only found at Fermi's works, it's almost magical ! Simple and elegant as Fermi! First published in 1937, this book is a masterful treatment by a master physicist. Weighing in at just over 150 pages, it manages to cover all the really essential topics in this subject. Furthermore there are a few excellent examples that nicely illustrate the power of thermodynamic methods. The treatment and use of free energy are notable high points in this work. Sadly, this book is probably still not appropriate for readers who have no knowledge of thermodynamics or the physics of heat more generally, but it would make an ideal second book on the subject. However, The Feynman Lectures are enough to make this book accessible. This is the perfect biography for anyone wanting to learn more about a great man, one of the greatest physicists.Enough of his physics were mentioned or included to make it non-trivial to me (junior astrophysics major, with Fermi distribution functions currently flying out of my ears) and yet I would have no compunctions handing this book to my little cousins in elementary school if they needed to read/write a book report on the life and accomplishments of one of the greatest and most influential scientists of our era.In fact, I would say that is the preferred audience, all physics students have heard of Fermi, but most children (and indeed, most adults) are unaware of his contributions to the way we see the world around us, and to history.All of that is here, in this biography easily accesible to anyone. I'm the author of this book. I sought to show how physics is done and how one of the greatest scientists of our time used his fine mind and friendly yet competitive ways to succeed. I believe I've made Fermi, the man, andthe physics he did accessible to a wide range of readers. Don't be put offif you found physics hard in school -- this isn't like that, and it ain'tbrainsurgery. Fermi was famous for being one of those very rarephysicists who are good at both theory and experiment. That helped as heand his team did the neutron experiments that led to his 1938 Nobel Prize.After a dramatic escape from fascist Italy, he and his family emigrated toAmerica. There he went on to create the first nuclear chain reaction (onDecember 2, 1942) and to play a major role in the development of the atombomb. After helping to win World War II, he helped set sensible sciencepolicy and did more great physics. His name is enshrined in the elementFermium, in the Fermi National Accelerator Lab, and in some of the mostimpotant concepts of physics. I didn't receive the book I tried to order. Amazon listed another book by the same title under the description of the book I was trying to order and I got that one instead. I reported the problem to Amazon but the issue was not satisfactorily resolved. So, this is not a review of the product in question. This was a fairly easy book to read.It was more of a personal account of what life was like for Fermi and his family.Not too technical, but still enjoyable. Enrico Fermi was a supremely talented scientist of the twentieth century, perhaps the only scientist who was uniquely accomplished in both experimental and theoretical physics. Fermi contributed massively to almost every branch of modern physics, and almost any one of his discoveries would have been enough to win him a Nobel Prize. In this book, his wife Laura Fermi affectionately and engagingly tells us the story of this singular individual and his all-consuming passion for physics. Laura brings a personal touch to the great man's life that is rarely seen. This is especially valuable for someone like Fermi who was a rather private individual and not fond of talking about personal matters. Laura recounts Fermi's childhood and background, including his taking refuge in physics after a personal tragedy in which his brother and best friend Giulio died when he was 15. After this incident Fermi's life trajectory was set. He quickly rose through the ranks to become Professor of Physics at Rome. Laura describes their meeting and how she was wonderstruck by the intellect and unassuming nature of the young man. She endearingly describes their time together in Italy during a decade that was very important and exciting for the development of modern physics. Much of the book's appeal comes from personal glimpses into Fermi's personal life as well as his and Laura's life in the United States after they fled from Mussolini's anti-Semitism (Laura was Jewish). Laura describes the remarkable discoveries Fermi made in Rome with neutrons, his enduring friendship with other extraordinary scientists and their migration to America. She has amusing stories about adjusting in the United States and about Fermi's singularly important work on the Manhattan Project. She describes the great secrecy during the project because of which Fermi could not tell her earlier about what was probably his greatest achievement- the construction of the world's first nuclear reactor, a watershed in world history. She also tells us about amusing aspects of life in the secret and remarkable community of Los Alamos, where there was an entire division created just for Fermi. Accompanying all these stories are anecdotes about the great physicists of the century, most of whom Fermi personally knew well and who respected him tremendously for his knowledge and modesty. All things considered, this is a rare glimpse into the life of a most extraordinary scientist provided by someone who personally knew him as well or better than anyone could. It is a very valuable book and deserves an important place in the history of physics. Excellent book.Very well written, especially considering that it was written in English by a non-native speaker of the language.Regardless of the writing, it tells a story that had largely been kept secret from my husband, even though he received a university degree in Physics.He has found substantial confirmation of what Laura Fermi wrote in several books by Emilio Segre, and at many Web sites. This is the report I wrote from this book!!! Did you wonder what stopped world war 2? Well I helped end it I'm Enrico Fermi the inventor of the nuclear pile. I was born Sep 29,1901 In Rome Italy. When I was born my mom sent me and my brother (Giulio) to live with nurses, because she did not have enough money to take care of me properly. But took me back home when I was two 1/2. I had one sister and one brother, Maria and Giulio. I was the oldest of the bunch. Then I started elementary school when I was 6. Soon I got to be at the top of my class. I stared studying algebra in 5th grade from the books I loaned from my dads co-worker milder. Milder and my dad both worked at the ministry of communication. my mom worked at the elementary school. But soon a tragic event struck my family. My brother Giulio died of a throat abscess I was a young age of 14. so I would not think about his death I immersed my self in to scientific study. I thing that all still stays stuck in my mind I always walked by the hospital where he had died for so long in till the I got inured by the pain of his death. Now I'm in high school and the 3rd year I had skipped. Now the adventure was just beginning, off to the Scuola Normale Superiore (University of Pisa) at the young age of 17. After four years studying at the University of Pisa, I was awarded his doctorate in physics in 1922. For the next several years, I worked with some of the greatest physicists in Europe, including Max Born(Physicist) and Paul Ehrenfest(mathematician), while also teaching at the University of Florence and then at the University of Rome. Then I Got married to Laura Capon in 1928 , soon giving birth to Nella 3 years later. In 1934, I came up with the idea to use neutrons, which have no charge, as projectiles. I would shoot a neutron like an arrow into an atom's nucleus. Many of these nuclei absorbed the extra neutron during this process, creating isotopes for every element. For the next member in my family is Giulio in 1936. He was named after my brother that had died in 1915. Though it doesn't seem to make sense, I found that by slowing down the neutron, it often had a larger impact on the nucleus. I found that the speed at which the neutron was most impacted differed for every element. For these two discoveries about atoms, I was awarded the Nobel Prize for Physics in 1938. The timing was just right for the Nobel Prize. Antisemitism was strengthening within Italy at this time and though I was not Jewish, my wife was. I accepted the Nobel Prize in Stockholm and then immediately immigrated to the United States. He arrived in the U.S. in 1939 and began working at Columbia University in New York City as a professor of physics. I continued his research at Columbia University. Though I had unknowingly split a nucleus during his earlier experiments, credit for splitting an atom (fission) was given to Otto Hahn and Fritz Strassmann in 1939. However, I quickly realized that if you split an atom's nucleus, that atom's neutrons could be used as projectiles to split another atom's nucleus, causing a nuclear chain reaction. Each time a nucleus was split, an enormous amount of energy was released. During World War II, I worked diligently on the Manhattan Project to create an atomic bomb. After the war, however, he believed the human death toll from these bombs was too large. In 1946, I worked as a professor at the University of Chicago's Institute of Nuclear Studies. In 1949, I argued against the development of a hydrogen bomb. It was built anyway. On November 29, 1954, I succumbed to stomach cancer at the age of 53. Then they named the 100th element after me, Fermium. 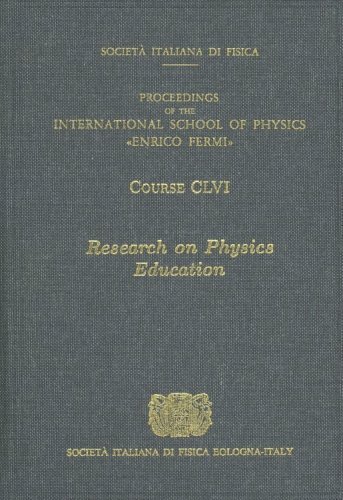 The lecture notes presented here in facsimile were prepared by Enrico Fermi for students taking his course at the University of Chicago in 1954. They are vivid examples of his unique ability to lecture simply and clearly on the most essential aspects of quantum mechanics. I am always surprised of how few physicists are aware of the existence of these handwritten notes. They are easy to read, concise, to the point, and make for both an excellent introduction to Quantum Mechanics and a text of reference. Fermi was notoriously a great teacher, and the fact that these notes are still handwritten and never edited actually add to them, making this a unique text. I still find myself going through it to check this formula or that derivation. 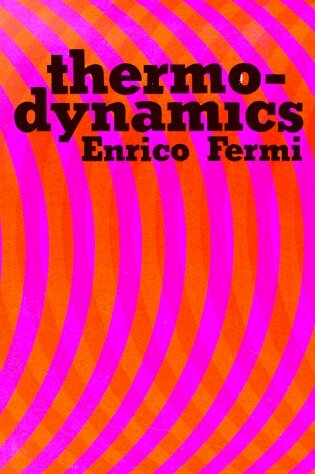 When I have first learnt QM, three completely different books were dear to me: Dirac's, Landau's and this one by Fermi. Why would somebody learn the subject from anybody else? This is perhaps one of the best supplemental materials to follow up with either during, or shortly after one's quantum courses.This is the closest most of us will ever come to taking a course by the genius Fermi himself, and this book is generally inexpensive.If you've read the description, you'll see that this is nothing close to a self-contained text book though, so some familiarity with QM is needed if you are to make the most of these lecture notes. The previous reviewer got it wrong ! I don't know which book the previous reviewer was referring to. This is a physics book, by one of the leading physicists of this century. 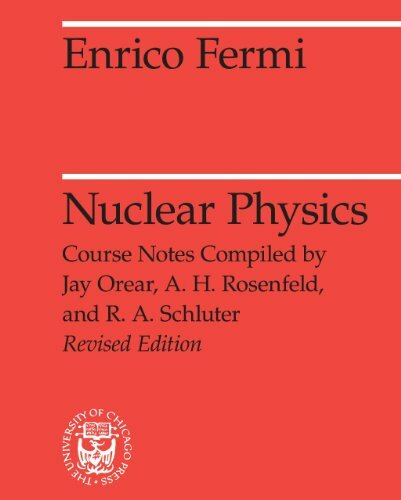 This volume presents, with some amplification, the notes on the lectures on nuclear physics given by Enrico Fermi at the University of Chicago in 1949. 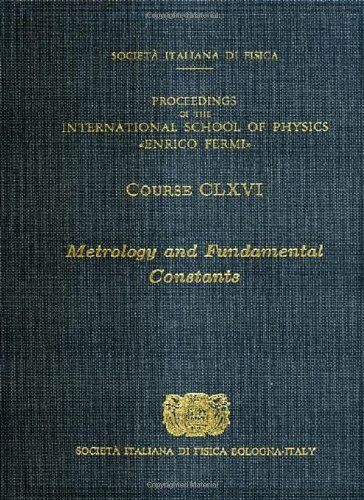 As I'm very interested in geometries of the nucleus, I ordered a copy of this notes of a lecture given by Enrico Fermi summarized by some of his students. It introduces into shell-, gas-, and liquid drop-theory of nuclei. It gets really complicated in the interaction of different radiations with matter. But I learned what a well is, how to apply QM to the nucleus. All kind of decays are explained in detail with respect to the experiment. The book also covers the theory of mesons, which are the particles of the strong-force interaction. The last chapter is about cosmic rays. The text was written with expertise about the nature of the atom, of nuclear decay rates, and of the nature of radiation beyond Plank. It is very mathematically based (as all good physics books are), however, it was beyond me mathematically at times, and took about ten reads to comprehend the basic mathematical structure and implications. It is excellent if one already has a background in nuclear physics, and is a wonderful reference. A great master applies quantum mechanics. 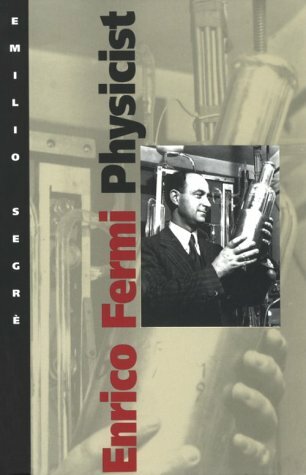 Overall, the book "Enrico Fermi Physicist" was very informative and interesting.The long time friend and first graduate of Fermi, Mr. Emilo Segre, stood by Fermi's side for many years.Mr. Serge also wrote the book, and was able to do so in a very all-inclusive manner.Not only does the book teach us everything that Fermi's has accomplished through his long and illustrious career as a physicist, but it also shows us a very human side of this brilliant mind.There are stories about Enrico's childhood dispersed intermittently throughout the book, so we can look at Fermi as a regular person, rather than as a series of brilliant mathematical laws and experiments.Due to the chronological design of the book, we see Enrico grow from a young and furtive mind, with an unrestrained sense of enthusiasm for math and science, into an old and wise master of physics. 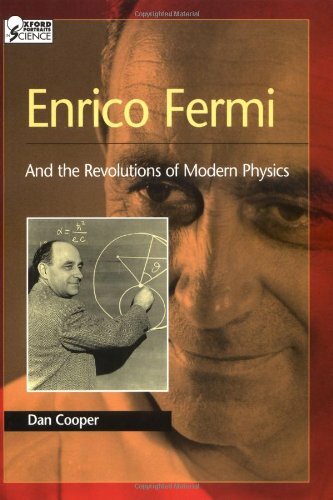 I think that Emilio Segre was compelled to write his book on Fermi for several reasons.By reading the book it is very clear that Segre has the utmost respect and appreciation for Fermi because when he describes the man it is in a tone of awe.He spends almost a page later on in the book talking about how impressed everyone was by Fermi, and how the man's brilliant mind warranted respect form all who could see him work.I also think that Segre felt some type of duty, almost a responsibility, to share Fermi's story with the rest of the world because he knew he was better qualified for the task than anyone, thanks to his close relationship with Fermi. By reading this book one learns of Fermi's classical experiments, which would eventually come to yield the atomic pile, and later help foster the construction of the atom bomb to be dropped on Hiroshima and Nagasaki in World War II.There is also a myriad of additional scientific details in the book, depicted in confusing and esoteric jargon.Personally, I think the book could have been more simplistic in the explanations of Fermi's work, instead of spending so much time with detailed information of little significance to the average reader.Overall, the book was engrossing, but excess scientific information gets a bit cumbersome later on in the book. Science buffs who also like a bit of history and want to learn about a scientist's life should read this story.As far as scientists go, I found Enrico Fermi to be one of the more fascinating scientists to ever live.Through reading the book, Fermi is revealed not only as a scientific and mathematical genius, but also a fun loving kid, who was almost expelled from school for a prank he pulled. I found this entire work to be well written and very informative on both the more personal life of Enrico Fermi, and on his various accomplishments and work regarding radioactivity and physics. Despite being written from a more personal view, as it was authored by a friend, the book maintains its commtittment to detailing the events in his life, including what influenced him and what he in turn influenced. A fascinating tale of a Nobel Prize Winner who worked on the infamous Manhattan Project, this book lists the many discoveries Fermi came upon and what his work later led to in the discovery of producing the fission needed for reactor and atomic weapons. I would recommend this book to anyone interested in this area of physics, and those interested in the people tied to the Manhattan project. 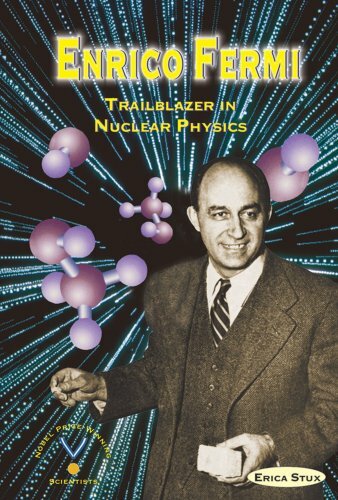 As a scientist, Enrico Fermi was an accomplished individual, and this book is able to bring to light the depth of his character and efforts in his respective field. Written from his friend's perspective, the retelling of his life is very well planned and thought out, and I commend the detail Segre put into its creation. With various interviews and detailed accounts of his life, this book is an invaluable resource for understanding more about the atomic bomb and the people who helped bring it to life. One of the most important things books serves to do is to remind American citizens how lucky they are to have gotten such great physicists and scientists to come support this country and how invaluable they are today, as they gave us a chance for the future. I've always been fascinated with Fermi's life and knew very little about him.I'm spending too much time reading on present day problems and people complaining about their rights being violated.Time Magazine rated Fermi one of the Top 20 scientists of the 20th century, including Einstein, Salk, Wright Brothers, Hubble and others.Fermi's wife was Jewish so in the late 1930's they left Italy to come to America (real lucky for us).Imagine adding Fermi to the Nazi research and subtracting him from our research.I think we would all be talking German today if Fermi assisted the Nazi's.I am not a scientific person (like the prior reviewer has so expertly depicted)but a realist.After America declared war on Italy, Germany and Japan, Fermi was declared an enemy alien, like many Italian Americans.Fermi's travel was limited and his mail read by the government. Did Fermi leave America, did he ask the Supreme Court to rule if his rights were violated, did he go to the newspapers, no he continued his work to help defeat the Nazi's and Imperial Japan.Imagine Fermi one of the greatest of the 20th century being restricted in his travel.Today, every two bit con artist complains today their human rights are being violated if their back packs are searched.I did not understand any of the scientific writing but the man was remarkable and history has judged him one of the best.Not many people real know his story, unless you are in the scientific community. I'm not sure why, history would be a lot different if Fermi had not come to America.If you do not understand the scientific part read the War Years and Professor at Chicago.With Salk, Einstein, Hubble, Fermi changed the world.Think where we would be today without him. Think about all the great scientist in the last cenury, only 20 picked, Fermi was one of them. I thought this book was great and did a great job of pacing the reader through Enrico's life, as well as superbly establishing a connection between the reader and Enrico. 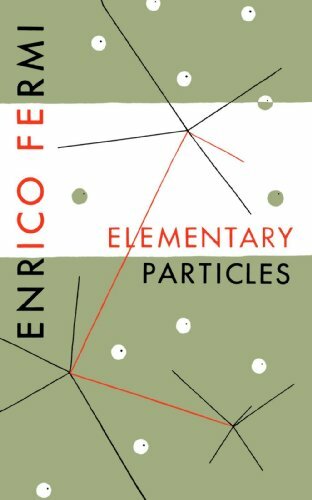 Emilio Serge did a great job of making it feel like you actually knew Enrico Fermi in real life which made the book that much more engaging and enjoyable. To be honest I found the beginning of the book the most interesting, more specifically Enrico's childhood experiences, influences and how he became interested in physics altogether. 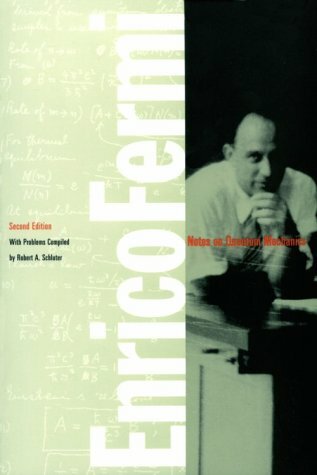 After checking multiple online sources, I found the book itself to be one of the most comprehensive sources for information on Fermi, as it includes the entire scope of his accomplishments, dreams, failures and life changing experiences. Written in a very simple yet elegant manner, Serge writes with an embedded loving friendship that still exists despite Enrico's untimely death at the young age of 53. Every page is filled with a seemingly endless number of intriguing facts about Enrico's life, whether it be his troubles and resistances along the way to success or the outcome that occurred after his development of the atomic bomb. Recommended. 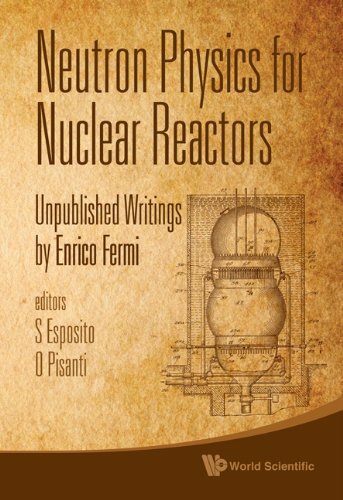 This unique volume gives an accurate and very detailed description of the functioning and operation of basic nuclear reactors, as emerging from yet unpublished papers by Nobel Laureate Enrico Fermi. In the first part, the entire course of lectures on Neutron Physics delivered by Fermi at Los Alamos is reported, according to the version made by Anthony P French. Here, the fundamental physical phenomena are described very clearly and comprehensively, giving the appropriate physics grounds for the functioning of nuclear piles. In the second part, all the patents issued by Fermi (and coworkers) on the functioning, construction and operation of several different kinds of nuclear reactors are reported. Here, the main engineering problems are encountered and solved by employing simple and practical methods, which are described in detail.